Weaving themes of grief and remembrance into a story about the NAMES Project AIDS Memorial Quilt, Atkins (Aani and the Tree Huggers) imagines family and friends piecing together a quilt panel to commemorate a loved one. Told from the perspective of Lauren, the picture book affords some exploration of the mourning process, but leaves some key questions unanswered. AIDS, for example, is never mentioned in the body of the story (an afterword includes a brief mention). Various passages assume a level of sophistication that may be beyond the intended audience, as in veiled references to Grandpa's absences from an earlier memorial gathering and from the quilting party (""Grandpa says he doesn't know how to sew,"" says Grandma). Atkins is eloquent at times (""Lauren's stitches didn't always go where she aimed them, the way a tossed ball didn't always land where she meant it to""), but her tone is so measured as to seem self-conscious. First-time illustrator Hills's muted works are mostly still lifes or frozen-seeming portraits, and even the few ""action"" scenes (e.g., of Lauren's brother proffering a contribution to the quilt) seem static. Uncle Ron (to whom they dedicate the quilt square) himself is seen only with his face hidden from readers, as he and Lauren ice-skate outdoors. Hills contributes a clever homespun touch--a border of ""cross-stitching"" that outlines each block of text and grows longer on each spread. While a picture book introduction to the AIDS Memorial Quilt may be welcomed, on the whole, this studied offering may leave children cold. Ages 5-up. 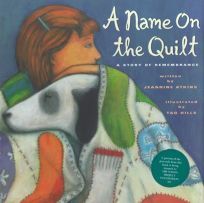 (Feb.) FYI: A portion of the book's proceeds will be donated to the NAMES Project Foundation.